The efficiency of Opportunity Driven Multiple Access™ (ODMA™) technology stands poised to transform wireless data networks. The current environment is of rapid and substantial fluctuations in connectivity. We all experience it and the issue prohibits efficient use of conventional networking techniques. ODMA is a subscriber-based relay mechanism that employs adaptive, opportunistic communication between network stations. It creates a full-mesh network comprised of low-cost relays and subscriber units that become relay stations themselves. The ODMA network accommodates rapidly changing connectivity between stations and routes messages on a co-operative basis. Broadband capacity is optimized and throughput improved while power consumption and interference is minimized. ODMA is the right technology for networks with a large number of mobile, wireless stations. 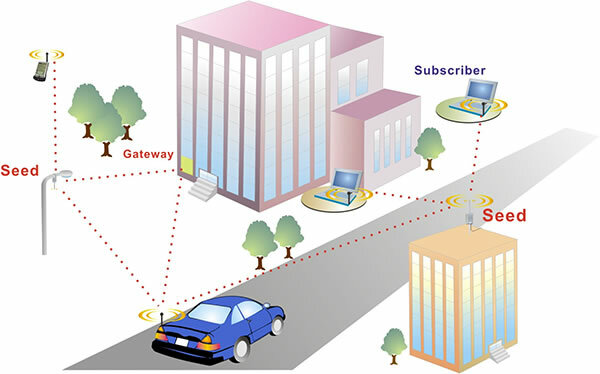 With probe signals, connectivity information is collected by each station regarding its immediate neighbors. The signals are, in turn, broadcast to the others. Stations continually indicate availability, and identify other stations with potential connectivity. Various parameters are controlled in response to incoming information: transmission power; data rate; message length and priority; and message time-to-die and retransmission. Transmissions are timed to take advantage of peaks in the signal-to-noise levels. By operating in peak mode, transmission power is reduced, which results in less interference and reduced need for retransmissions. The probing mechanism is at the heart of this process. Stations in close proximity probe at higher data rates and low transmission powers. Stations use lower data rates when isolated without sufficient neighbors at the higher data rates and at maximum power. Each station transmits probe signals to find other stations, communicating connectivity information. They vary their probe power until a predetermined number of stations indicate they detect the probes. If a station never acquires the required number of neighbors, it remains at the lowest data rate and maximum transmit power. In a wireless mobile network, stations are constantly moving, and thus neighbor information constantly changes. If the amount of neighbors exceeds the requirement, a station increases its data rate until the amount changes. If it reaches the maximum, it lowers its transmission power until it reaches the minimum, or the number of neighbors changes again. There are data channels for each probing channel. The station requesting a change will randomly select an available data channel. When the other station receives the request it changes to that data channel. The stations continue to communicate until neither has data to send, or if the maximum time for remaining on the data channel expires. All probing stations increase and decrease their power until all stations collect a predetermined number of neighbors. This process consists of increasing and decreasing the power level of probes and indicating in probes which other station's probes are heard. In this way all stations can learn what power level they require to reach various neighbors. Each time a station probes, it indicates its own transmit power and noise floor together with a list of the stations it has as its own neighbors. Every time a station hears another station probe it calculates from the probe the path loss and the power required to reach the station from the path loss and the noise floor of that station. The path loss to the neighbor and the power required to reach the neighbor is stored in the neighbor table kept at each station. If a neighbor is no longer heard then the path loss and power level required to reach the station is increased or "ramped" in the table until a certain level is reached at which point the neighbor is removed from the neighbor table. The network hierarchy is not centralized, but is rather fully distributed and only message priority and transmission opportunities dictate message flow. The stations work co-operatively to maximize overall network throughput. The distributed nature of the system provides resilience and the network will not fail catastrophically as there is no single point of failure as is the case in networks that are reliant on base stations or centralized controllers. The combination of adaptive channel hopping, transmission power and data rates is an important element of the ODMA system, thereby minimizing noise, interference and channel congestion.